Amazon Queen is a slot machine game created by casino software developer WMS Inc. offers you a lot of benefits and enjoyable prizes. You have an opportunity to enjoy the wild nature of Amazon Rainforest with this 5-reel casino slot. Its pleasant music and numerous bonuses with enjoyable prizes won’t let you stay indifferent. Spin the reels and wait for the winning combination to appear. All wins appear within 25 pay lines, which number you can change with controls on the dashboard. They are paid from the leftmost to rightmost reels according to the paytable. Your total win is cashwin multiplied by total bet. Total bet consists of number of lines and cash bet. So that, the more you bet, the more you win. There are a lot of surprising slots symbols and bonuses of casino that are even more enjoyable. 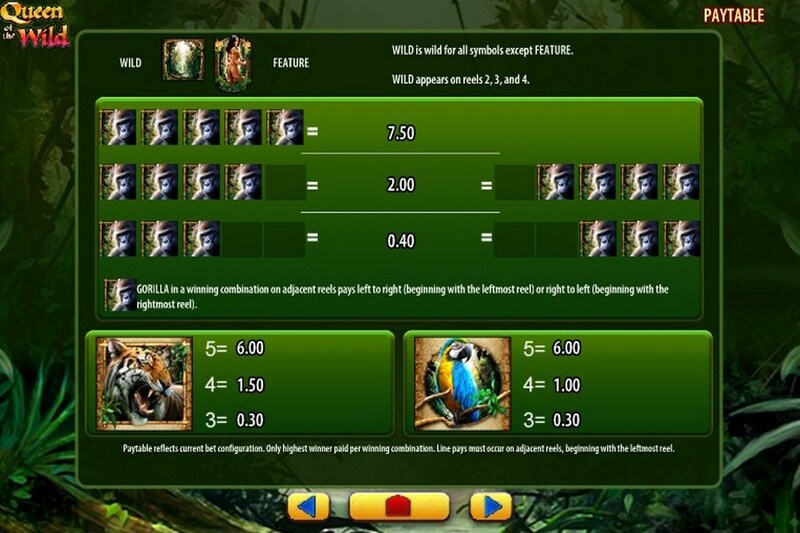 You can win up to 42.00 due to 3-5 slots symbols of a tiger, a parrot, a snake and slots symbols of card suits. Moreover, Spade (T) and Spade (B) substitute for Spade. The same feature is applied to hearts, clubs and diamonds. Gorilla symbol of slot pays form left to right. You can have from 1 up to 3 gorilla symbols on one reel and win up to $52.00 with their help. 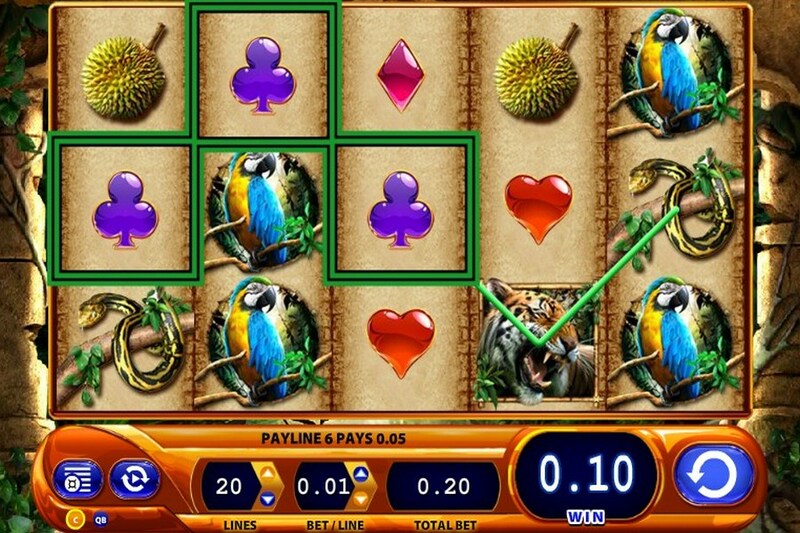 Wild card appears on reels 2, 3 and 4 and substitutes for any symbol of slot on the screen, except Features. 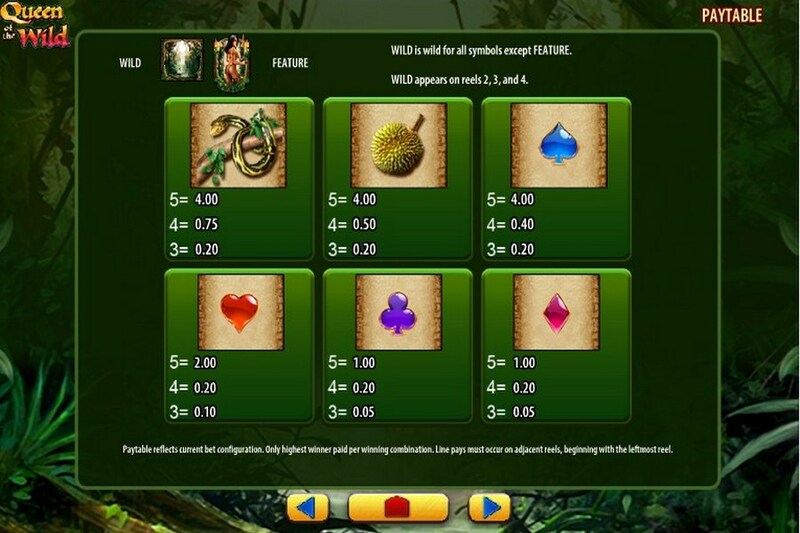 Feature slots symbol, charming Amazon Queen, triggers free spins mode, where you can win even more. Enjoy playing Amazon Queen slot machine game with free spins for fun, as well as other free slots by casino game provider WMS.